Housing crossed two lines in the past several weeks that a decade ago might hardly have been imaginable. One threshold housing’s community of vested and invested players just crossed was a homeownership rates trajectory that had clawed back, fits and starts from a lowpoint of 62.9% five quarters ago, to 63.9% in the third quarter of 2017. Compared with a rate over 69% in the early 2000s, that’s a modest come-back. There’s another way to look at it, as demographer Wendell Cox notes in this piece on the New Geography blog. The appropriate comparison for today’s home ownership rate is not the debacle of last two decades. 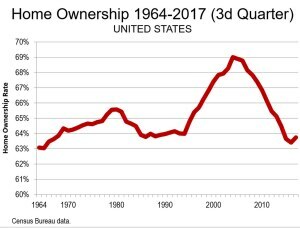 It is rather the success of the decades before, which saw a nearly 50 percent increase relative to pre-World War II home ownership rates from 44 percent in 1940 to 64 percent in 1970. The current 63.9 percent home ownership rate is nearly as high as the average annual rate of 64.3 percent from 1964 to 1994. The maximum home ownership rate during those three decades of apparently successful regulation and competent mortgage industry management was only 1.7 percentage point higher than today (65.6 in 1980). The latest flow-of-funds data from the Federal Reserve confirmed that home-equity wealth reached a new nominal high this year: $13.9 trillion at mid-2017, $0.5 trillion above the 2006 peak and more than double the $6.0 trillion amount at the trough of the Great Recession. point higher than today (65.6 in 1980). 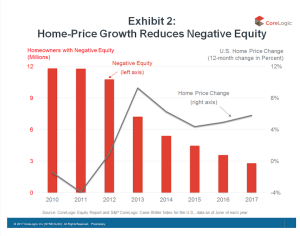 Nothaft adds the point that if the Core Logic S&P Case-Shiller index nets out at a 5% increase over the next 12 months, it will create another $1 trillion in household equity wealth, quite a shot in the arm along with being a new high-water mark in household wealth in America. Now, that’s the good news. We might take it at that, or we could look at both Tax Reform measures hastily making their way through Congress, and curb our enthusiasm just a bit. Take a look at another metric for a moment before letting your optimism flow unchecked. Overall well-being among U.S. adults has declined substantially this year. The Gallup-Sharecare Well-Being Index score so far in 2017 is 61.5, down 0.6 points from 62.1 in 2016 and on par with the lower level recorded in 2014. This decline is both statistically significant and meaningfully large. Well-being is a business, health, economics, and societal bellwether, not to be ignored. When people sense that a system–social, economic, cultural, political–is rigged against them so that their efforts, initiative, ideas, and beliefs hold increasingly less sway in their lives, well-being diminishes. That’s a risk. The question Congress members need to ask themselves now, in their rush to shift the switches and levers of taxation, is a simple two-parter, with massively complex ramifications. Do both the House and Senate plans–in their current form–remove costly incentives for affordable housing and homeownership to give more middle class workers more direct means to pursue meaningful economic and social mobility? Or, in contrast, will the addition of disincentives for both homeownership and affordable housing programs wind up costing more middle class workers more in lost home values, more access to affordable rental housing, and more means to make their way upward in economic and social terms? We’d argue that either path is equally reflective of the strong hand of government interceding to the benefit of interest groups. We’d also argue, as the National Association of Home Builders has proposed, that the mortgage interest deduction is by no means the “end-all” or an untouchable in tax reform planning. By all means, save the money that MID costs, and transform those savings into real dollars for middle class workers. But now is no time to be introducing legislation that will disincentivize Americans pursuit of the dream of homeownership, sap equity from current owners’ homes, and put Americans’ well-being at further risk of decline due to an increasingly pervasive sense that a system is “rigged” for economic and social mobility exclusively for big corporations and the very wealthy.